Bomberman Land Touch! 's menus are clearly labeled, but they don't give much information before options are clicked on. After selecting "Bomberman Battle Pack" (without any further description), "Multiplayer" can then be selected. There is a forced opening sequence as the cartridge loads, but it is far from the longest that I've experienced. The download takes around 35 to 40 seconds. The menu functions are large and well-separated. As soon as you click on "Bomberman Battle Pack", the menus change to button controls exclusively (you can no longer tap on the options you want). This isn't because they wanted to save space on the download because the menus don't get downloaded and this change takes place even before you select the "Multiplayer" option. The entire control scheme in Bomberman Land Touch! 's classic gameplay (Single-Card Download or otherwise) is button-based. There isn't any touch screen control. None. While Bomberman used button controls for the main gameplay functions (admittedly, they just make more sense than forcing touch controls where they have no advantage), the menus benefitted from the touch controls. The bomb launcher in revenge more is a little more acurate with button controls than it is with touch controls, but all of the aiming challenge is gone; having both options is the best scenario. There's nothing wrong with the button controls in the gameplay, but the control could be better. The Good: Guests can now see what the hosts are doing in the Board Selection Menu, Options Menu, and Handicapping. The Good: You can now have a "Power Down" option (you can stop negative items from showing up). The Good: Handicapping is now on the main menu and is no longer treated as an offshoot of the board selection (the best change). The Good: A new victory alternative ("Score") was added. The Bad: The tie breaker (now called Sudden Death) can't be turned off. The Bad: No new boards, items or menu options (aside from "Power Down" and "Score") were added. The Ugly: There were 30 boards. Now, there are 21. They removed 9 boards. The Ugly: There were 20 items. Now, there are 7. They removed 13 items. The Ugly: You can no longer change your Bomberman's color. The Ugly: You can no longer see people's names during the game. The Ugly: All touch screen controls have been removed. The Ugly: All voice controls have been removed. The Ugly: All Skull Settings (boards, items, menu options, etc.) have been removed. The Ugly: The Slots option has been removed. On its own merits: The look of the game is detailed 3D elements in a 2D environment, and the details look good. The sound is neither essential nor terrifying. All players get music coming out of their Nintendo DS system's speakers. A quick note before I review this category. Bomberman Land Touch! adds in en entire story mode, online play, several mini games, and introduces Nintendo DS owners to their cross-game "Bomberman Battle Pack" system. None of these things, however, are directly related to the Single-Card Download experience and are therefore not reflected in these review scores. There was a lot removed from the Single-Card Download experience of Bomberman. Everything from boards to items to whole modes and features were removed. While there's nothing wrong with what is there, there just isn't as much to do. I'm not just saying this in comparison to Bomberman, but also in comparison to all other similar Single-Card Download experiences from similar Nintendo DS games. The game feels like it's another cartridge's mini-game. It's just not as fun. It's often hard to determine just much the depth of features in a game contributes to its actual play value. In Bomberman Land Touch!, the lack of depth definitely hurts the play value. I understand that for Multi-Card gameplay between two different Bomberman games (a nice feature) would need to be restricted to make the game maintainable, but why take the features out of the "Bomberman Battle Pack" single-player game and Single-Card Download play? I have nothing against any of the new modes, but a Nintendo DS cartridge with a higher capacity - and putting the other non-"Bomberman Battle Pack" options back in for Single-Card Download and single player classic play - would have gone a long way and been very much appreciated. Put back all items, boards, and modes that were removed. Increase the number of board shapes/designs (still requested from the DSSingleCard.com's Bomberman Review). 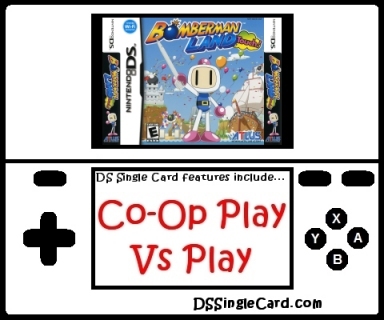 Take all of the special rules associated with specific board and make them selecatble on any board via a menu (still requested from the DSSingleCard.com's Bomberman Review). Click here to return to the DSSingleCard.com Bomberman Land Touch! profile.